Texas grass sage was brought to the attention of Plant Select by Lauren Springer Ogden and several gardeners of the Denver Botanic Gardens. Seeds of the hardiest plants were collected on and grown in the trial gardens at Colorado State University in Fort Collins and at the Chatfield campus of Denver Botanic Gardens. Among the varying seed-grown plants two selections were narrowed down for another round of evaluations. Autumn Sapphire sage is the culmination of many years of evaluation and rigorous selection to bring to market a plant that blooms well at the end of the season and has all the best qualities that Texas grass sage has to offer. 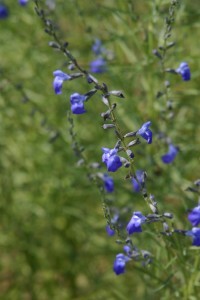 Come late summer, numerous cobalt blue flowers erupt from the finely textured, pungent foliage. It’s willowly appearance is a nice addition to meadow gardens, xeriscapes and especially wildlife gardens. Combine with bright colors such as red, yellow and orange for show-stopping fall color. For added contrast in the garden, combine its whispy stems with stronger leaved plants like yucca or agave. Autumn Sapphire™ sage is an excellent nectar source for late season pollinators such as bees, butterflies and hummingbirds. Low maintenance is the mantra of this wonderful perennial, as it does not require deadheading, except when cut back in early spring. It is happiest in a well-drained sandy or gravelly soil and kept on the dry side. Where in Colorado can you buy Autumn Saphire Sage and Pink Flamingo grass? Pink Flamingo grass is a zone 6 plant, so rarely found at Front Range garden centers or nurseries. Instead, you might try our UNDAUNTED ruby muhly grass, which is a zone hardier. Plumes aren’t as robust and showy as flamingo grass, but they are stunning in their own right. Autumn Sapphire sage should be available at many of our member retailers – check the list in the “Where to Buy” section of this site. They may not be readily available until later in May, however. Tagawa Gardens, Nick’s Garden Center, Paulino Gardens and Echter’s usually try to carry a large assortment in the Denver Metro area. Up north, The Flower Bin and FOrt Collins Nursery are usually good bets. Call around after Mother’s Day before heading out, just to be safe. Good Earth Garden Center in Colorado Springs carries all of these as well.